This duffle bag is designed to help you carry more through more efficient packing. Ask any traveler about their biggest frustrations when on the road, and almost always you’ll hear “not enough space” as one of the top contenders. To help consumers overcome this frustration, some vendors are helping users pack smarter with less effort. EZ_Duffle is a versatile travel bag which reached their original campaign funding goal of $25,987 in only four hours. The bag is engineered to make it easy for users to organize their packed items and stay on the move regardless of their destination, be it across town or through a short trip. 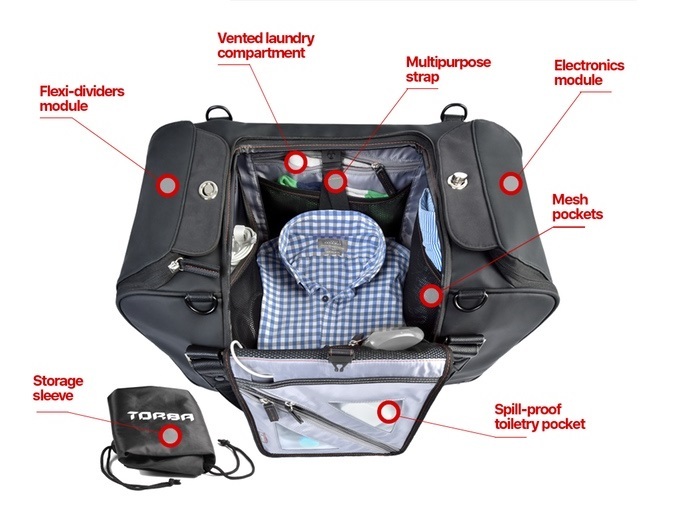 The travel bag is equipped with a variety of purpose-built compartments including interior mesh pockets that include: a vented laundry compartment, electronics module, mesh pockets, a spill-proof toiletry pocket, and a flexi-dividers module. To keep laundry fresh, there’s also a vented laundry component which enables users to air their laundry (pun not intended) without the odors spilling over onto their other belongings. The electronics module has a padded tablet pocket, booklet space, device pocket, large mesh pocket, pen holders, and a mesh zip pocket. The flexi-dividers module has a full micro Velcro surface, Velcro attachment, and padded dividers. The modules’ rear has attachment clips and a large mesh pocket. EZ_Duffle is designed to comply with most airline carry-on requirements. The bag is sized 20” x 9” x 11.5”, has a capacity of 34L, and weighs 1.8 kg. It has six shoulder strap hooks, magnetic handle clips, a side grab handle, padded shoulder strap, and backpack carry mode with chest straps. It also comes with a dedicated storage sleeve which can be used as an extra laundry bag or a shoe sleeve. Since traveling often involves inclement weather, EZ_Duffle has YKK waterproof zippers and a scratch resistant, waterproof exterior. There also are thick handles to ensure resilience even under repeated heavy loads. In order to help users stay powered while on the go, there’s an optional battery kit which includes a preinstalled removable 10,000 mAh battery with access to the smart pockets. So far the makers of EZ_Duffle have raised over $56,000 via crowdfunding with an estimated shipping date of October 2017. Early bird pricing for the device is $150 which is 50% off the suggested retail price. The additional pouch and battery are $30 each. Personally, I like how stylish the bag is. So many places to put things and a great look at the same time! Perfect for those that travel light, but need the extra space. Pretty wicked that this thing fits into a little bag! Also, being able to customize the inside is pretty cool and reminds me of my old school camera bag. Today, ANY bag, backpack or briefcase has better come with a charging port or some sort of power converter installed. That is just the new feature these days.